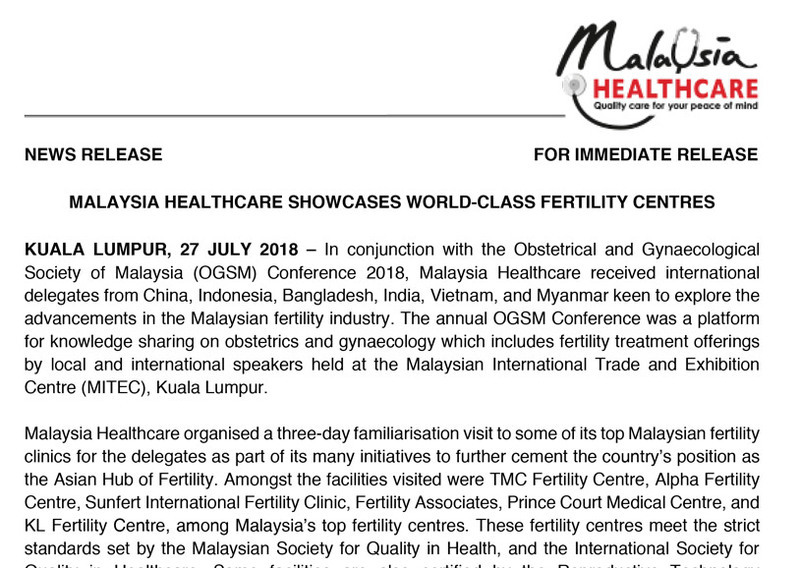 KUALA LUMPUR, 27 JULY 2018 – In conjunction with the Obstetrical and Gynaecological Society of Malaysia (OGSM) Conference 2018, Malaysia Healthcare received international delegates from China, Indonesia, Bangladesh, India, Vietnam, and Myanmar keen to explore the advancements in the Malaysian fertility industry. The annual OGSM Conference was a platform for knowledge sharing on obstetrics and gynaecology which includes fertility treatment offerings by local and international speakers held at the Malaysian International Trade and Exhibition Centre (MITEC), Kuala Lumpur. Malaysia Healthcare organised a three-day familiarisation visit to some of its top Malaysian fertility clinics for the delegates as part of its many initiatives to further cement the country’s position as the Asian Hub of Fertility. Amongst the facilities visited were TMC Fertility Centre, Alpha Fertility Centre, Sunfert International Fertility Clinic, Fertility Associates, Prince Court Medical Centre, and KL Fertility Centre, among Malaysia’s top fertility centres. These fertility centres meet the strict standards set by the Malaysian Society for Quality in Health, and the International Society for Quality in Healthcare. Some facilities are also certified by the Reproductive Technology Accreditation Committee (RTAC), ensuring quality standards are met. “We are very pleased to showcase our world-class fertility treatment providers to these international delegates who can experience for themselves what Malaysia can offer. On that note, we welcome everyone to come and Experience Malaysia Healthcare and Embrace Malaysian Hospitality,” commented Sherene Azli, Chief Executive Office for Malaysia Healthcare. Malaysia is fast becoming a popular destination for healthcare travellers from China, particularly for Assisted Reproductive Technology (ART). Attracting factors are mainly due to its exceptional success rate averaging around 65% for In-Vitro Fertilization (IVF) for clinical pregnancy rate, compared to the global average of 50%. This is coupled with the affordability, ease of access and high-quality care that Malaysia Healthcare offers. Malaysia Healthcare served more than 1 million healthcare travellers last year. The country provides a seamless end-to-end journey experience for healthcare travellers at every point of their journey from pre-treatment to post-treatment. Backed by the government and with support from the Ministry of Health, Malaysia’s healthcare industry is well-regulated with strong emphasis given on patient safety. The country was named “Medical Travel Destination of the Year” by the IMTJ Medical Travel Awards from 2015 – 2017, with a highly commendable mention at the recent IMTJ Awards 2018. 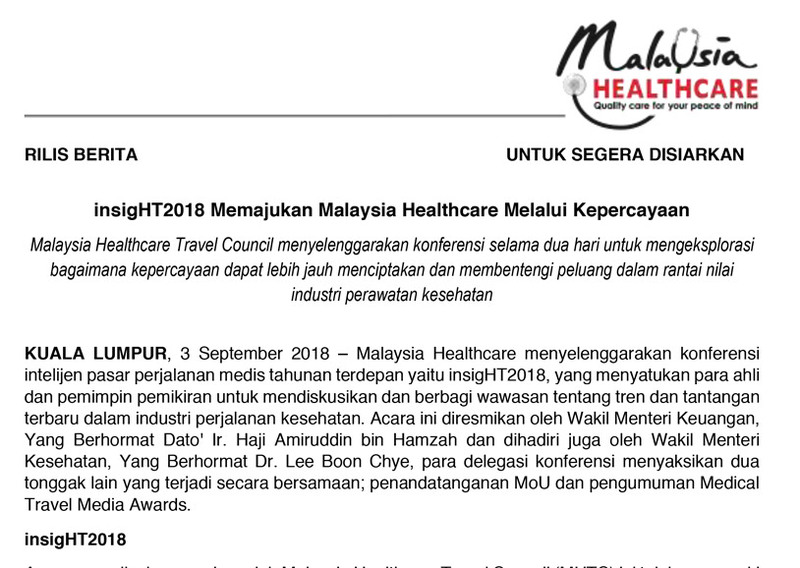 MHTC was also recognised as IMTJ’s “Medical Travel Cluster of the Year” from 2017- 2018. Malaysia acknowledged as the “Best Country in the World for Healthcare” by International Living’s Annual Global Retirement Index from 2015 to 2017, and ranked as the top destination in Asia for retirement in the 2018 index. These achievements are a testament to Malaysia Healthcare’s commitment in providing unparalleled medical services.